The State of Texas is has recently started "The Texas Paddling Trails which is a new program to develop public inland and coastal paddling trails throughout the state and then support these trails with maps, signage and other information. These trails provide well-mapped accessible day trips in a variety of settings and for all levels of paddling experience. There are currently seven coastal paddling trails and one inland paddling trail, with several communities in the process of applying for participation in this program." Texas Parks and Wildlife now has 72 designated Texas paddling trails, Mission Reach being the newest. Learn more by visiting Texas Parks and Wildlife Paddling Trails. The Wilbarger Paddling Trail is wide and slow-moving 14.3 miles with a few minor rapids, but no man-made obstructions to avoid, although snags and debris should be avoided. The Trail supports a great diversity of plant and animal life along the river and beyond its banks. A class one clear, clean and safe and great for families and groups. Lots islands on every stretch for camping. This wide, slow-moving 6 mile trail that moves downstream, the banks of the river gradually steepen and become very scenic with high sandstone bluffs and cliffs. The river provides unique habitat for the blue sucker, a fish species that is listed as threatened in the state of Texas. A class one clear, clean and safe and great for families and groups. Lots islands on every stretch for camping. These three trails offer a variety of experiences through and around Martin Dies, Jr. State Partk. 3-16 miles of amazing wildlife depending on which route you choose. The 100 mile long San Saba River flows through rocky rapids, under towering oaks and pecan trees, and past wide pastures. This is not an official paddling trail. The Lake provides a tremendous recreational resource for the state’s capitol, including hike and bike trails surrounding the shoreline as well as paddling, rowing, and fishing in the lake. This 9.9-mile trail is lined with mature trees and a spectacular mix of limestone cliffs and shelves. Paddlers will enjoy an exciting 3-6 hour ride on a variety of rapids between gentle stretches. This trail covers about 5.3 miles of quiet water on the Navasota River from the Confederate Reunion Grounds to Fort Parker State Park. The route is characterized by hardwood bottomlands and limestone bluffs. The water is generally calm but levels can vary on this 21 mile trail which winds past white sand beaches. The bald cypress, tupelo and other tall trees line the banks of the creek. The trail which begins at the boat ramp in Beaumont and the trail goes up the Neches River in to Pine Island Bayou and Cooks Lake through the bald cypress and water tupelo trees to Scatterman Lake, then down the Neches River back to the boat ramp for a 4.8 mile trip. Distinguishing features of this wild & scenic River is her pristine, unspoiled scenery, Cypress/Tupelo Sloughs, Bluffs, abundant white sandbars, enjoyable wildlife and aquatic life. Distances vary from 10-40 miles. This 1-8 mile loop trail can be navigated in 1-4 hours depending on turn around point. The river supports numerous varieties of fish and 100 species of waterfowl have been counted. Water levels can change according to rainfall so caution is advised. Offering 10 trails and 50 miles of canoe and kayaking for visiting paddlers! Explore the mysterious maze of sloughs, swamps and bayous for which this beautiful region is known. The trail is 11.9 miles which takes 6-8 hours along a beautiful area of the Sabine River. There is a camp 5 miles into the trail for paddlers who would want to spend a night. Make sure to check the river depth as it can fluctuate. This 4.9-mile trail offers a spectacular outdoor experience for nature lovers, outdoor recreation enthusiasts, families, and paddlers of all skill levels. Once you reach the Hwy 360 overpass, turn around and enjoy the lazy current and prevailing southerly wind on your paddle back! Rentals are available at the Camp Store. This small lake is surrounded by 9.33 mile hiking, biking and running trail. A section of the lake runs by Dallas Arboretum and Botanical Gardens. Enjoy this 6.4-mile trail's beautiful scenery on Lake Ray Hubbard including views of Great Blue Herons, Bald Eagles and various other wildlife. Lewisville Lake Environmental Learning Area includes 2000 acres of tallgrass prairies and riparian forest tucked into the soft rolling hills with the Elm Fork of the Trinity River running through it. One launch site for the Trinity River and a another launch site for padding the Beaver Pond area. You'll get to observe wood ducks & other water fowl, many turtles, wading birds, and amphibians. This lower section of the Brazos River below Lake Granbury is quite scenic flowing through rolling hills covered with oak trees. Canoe enthusiasts will be rewarded with a scenic trip offering views of rugged cliffs, high bluffs, and cross-timber terrain. Fishing along this 20 mile stretch is very good. This 10.2 mile trail offers the paddler will pass under several interesting bridges and the concrete arches of the Houston Street Viaduct which was touted as the world's longest concrete structure, and is now listed on the National Register of Historic Places. Two paddling trails in the heart of downtown Waco that offer easy access to paddling trips offering unique views of the outdoors for beginners and experienced paddlers. 2.2-4.8 mile trip depending on route taken. On this w mile trail the paddler has great opportunities to view herons, egrets, ducks, turtles, frogs, deer, and many other wildlife species. The trail includes 12 stops at interpretive signs mounted at various locationsfor a great experience. Enjoy this 10.9 mile 3-6 hour trail as it is the first lake paddling trail on a beautiful lake where you can experience many varieties of fish, birds, plant and wildlife. Victoria Paddling Trail - Riverside Park is the second inland trail to be developed and it's a 4.2 mile stretch of the Guadalupe River in the Coastal Region. This section of the Guadalupe River is slower moving and bordered by scenic soft banks rather than the limestone bluffs of the Hill Country. This quiet reach can be paddled in 1-3 hours depending on flow rates. This 26 mile trail with that expose a beautiful geology of sand, sandstone and red Beaumont clay. While some sections of the bayou are straight-cut with low embankments, other sections are serpentine with high cliffs. A series of four loops ranging in length from 1.25 miles to 6.8 miles. The trails meander through an extensive black mangrove estuary, into sloughs and back lakes. This trail follows the western shoreline of Mustang Island in Corpus Christi Bay. You will see the beautiful, protected waters of Shamrock Cove and then paddle through marsh and spoil islands to the Island Moorings Marina in Port Aransas. There is 20 miles of natural habitat for observing birds and other small animals. You will find a shallow, oyster-encrusted estuary paddling paradise at the southernmost end of the lower Laguna Madre. A few miles west of the main bay is San Martin Lake. Both of these locations are great for paddling, fishing, and birding. 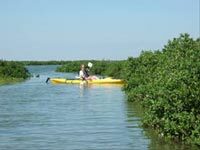 Christmas Bay Paddling Trail - The Christmas Bay Paddling Trail is a 19.1-mile circumnavigation of this pristine minor bay on the western end of the Galveston Bay complex. This small bay is unique since it supports the largest stand of seagrass (over 200 acres) on the upper Texas coast. Lighthouse Lakes Paddling Trail - The Lighthouse Lakes Paddling Trail was the very first Texas Paddling Trail and is actually a series of four loops ranging in length from 1.25 miles to 6.8 miles. The trails meander through an extensive black mangrove estuary, into sloughs and back lakes near the historic 1857 Lydia Ann Lighthouse on North Harbor Island. Paddlers can glide through mangroves and seagrass flats that provide outstanding bird watching and fishing for red drum, spotted seatrout and flounder in the maze of tidal channels and flats. See a Lighthouse Trail photomap. Galveston Island State Park Paddling Trail - Galveston Island State Park hosts three paddling trails, the 2.6-mile Dana Cove (Lake Como) trail, the 4.8-mile Oak Bayou trail and the 2.8-mile Jenkins Bayou trail. The Jenkins Bayou trail begins at the western end of Clapper Rail Road and takes paddlers along the bayou and out to the marsh restoration terrace field. The Oak Bayou Trail is accessed along the main park road and also highlights the terrace field, as well as areas of natural high marsh where laughing gulls, various tern species and oystercatchers may be found nesting each spring. The Dana Cove (Lake Como) trail begins at the end of the main park and continues through the seagrass beds that have recolonized behind constructed geo-textile breakwaters. Mustang Island Paddling Trail - The Mustang Island Paddling Trail consists of the North Trail (8.5 miles), the Shamrock Loop (5.24 miles) and the Ashum Trail (6.8 miles). All of the trails follow the western shoreline of Mustang Island in Corpus Christi Bay, and cover some of the best shallow-water fishing areas in Texas. The Ashum Trail follows the shoreline of Corpus Christi Bay over a firm sand bottom and allows for outstanding bird watching as well as sight-casting opportunities. The Shamrock Loop skirts the beautiful, protected waters of Shamrock Cove, where it connects with the North Trail, which follows the shoreline to East Flats and then meanders through marsh and spoil islands to the Island Moorings marina in Port Aransas.